Just picked up my first paid Drone Deploy project...will be flying it later today. I am excited and nervous at the same time. From what I have read it is advised that you prep the drone. Launch the DJI Go app to check sat locks, make sure the IMU calibrations and compass calibration is registering OK (no errors)...then close the DJI Go App down and launch drone deploy to run the mission. Any wisdom/tips would be much appreciated. As with everything I do I have been researching it pretty heavily. Very cool....I am just learning this myself so I don&apos;t have any valuable advise to offer except maybe: Don&apos;t allow yourself to get distracted by others. If others are around, kindly tell them to go away until you are finished. Concentrate on the task at hand and execute. Good luck and keep us up to date on your progress. Very interested in your adventure! Yeah...that is good advice for most of us pilots. I have a safety vest that says do not disturb...and this specific site is pretty remote. I will keep you all posted...hoping it goes well. You will have t let us know how you proceed in doing this work. I don&apos;t have advice. But congrats and good luck. Thanks for the response and well wishing...that works too. Be sure to give us an update on how it went. Hello and good day KennyB. Congratulations on your first drone deploy project. We wish you all the best. Have a safe and happy flying always. Thanks DJI Stephen...I will and always do...or try to. You are very much welcome KennyB. Thank you for your support. Big area - as it mentions 2 batteries! - Have a good flight should be fine, mine are. Kenny, what is your overlap front and side? Does your client have a spec of less that 1in/pixel ? Good luck! Let me know if you have any questions. I am an Enterprise customer and council member and would be happy to help. Please share your experience here and on forum.dronedeploy.com. Congratulations!! Keep us posted on how it went. 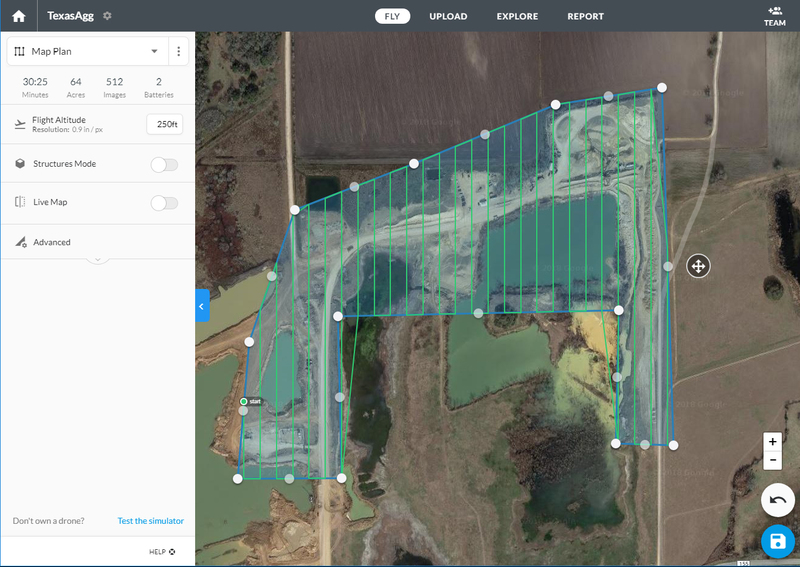 Using a P4Pro, DJI Go4, and Pix4D Capture App we have been able to fly extended mapping missions as the Capture App automatically creates break points in the mission when the battery gets to the point where a fresh one is needed. The P4 returns home, lands, app tells you to insert fresh battery and provides option to resume mission. Hit resume and after selfchecks, P4 takes off and resumes taking photos where it left off. Have not tried it yet with the new P4PRO RTK and RTK GS Ap as I flew only two test flights with that yesterday but I believe it will do the same thing. Thanks for sharing! Congrats mate! Kenny, where&apos;s that job report?? How did things go for the overall mission? Yeah...it went very smoothly. No issues what so ever. It took about 700 images...more than 5GB of data. It was very interesting process. I did as suggested and it went perfectly according to plan. Kind of weird watching it take off and fly away on it own. Watching it zigzag back and forth across the sky. All of this was predetermined by the client so I couldn&apos;t tweak the parameters. 75% overlap throughout 275ft. I thought for a minute I could complete on one battery...it got right near the end and the battery low level limit went off...I brought it back just to be safe. The second battery was only for the last row and a half. They didn&apos;t tell me to use a lower res...they might should have as at max resolution the total file size was almost 6GB. I will. Thanks. The shoot was Friday and it went over without any issues. It worked very well no complaints. I will let you know if I end up with any future questions. It was a mapping mission...I wasn&apos;t given a full brief but it seems, from what I could glean from talking to the people on site, to be a volumetric mapping. Some sort of mining going on where they have piles onsite and through elevations taken by the drone the can calculate volumes in the mine (outdoor open air mine). Thanks Maddox. It was pretty cool. Thanks RedHotPoker. Completed it Friday, it wasn&apos;t prepaid but they paid me that same day. It is supposed to be a monthly project so I guess if they are happy with what I did they will have me go out again. Yeah...sorry busy weekend. you can see my responses I already posted. It went very well. I am hoping to get a low res image of the completed map which I can later post. It shocked me that according to the software the drone was doing about 18mph and snapping pictures the entire way and they all looked good. Interesting.... any idea of what ore they are going to excavate there? I wish I knew. I am sure with time and continuing visits I will find out eventually. This was my first trip out there. Thanks. It took a little more than 700 photos due to the size of the property combined with elevation and amount of overlap. I unfortunately am just a vendor on this one...so no contact with actual client. If I understand what it is for they are delivering elevation and volumes...I don&apos;t think 3D models or plant evaluations. The upload was not to DroneDeploy...my client handled that part...I am sure it took a while 5GB+ of data. Thanks for being a positive influence in the drone world. I Appreciate your input on the forum. Good work Kenny. This is the imaged area...almost 70 acres...it took about thirty minutes to fly the project. The final image came as a 120MB JPG file that when opened in Adobe Photoshop was almost 4GB . I have to say this is a pretty impressive process. What these drones can do is amazing. I am hoping I get the repeat...which means I will be out there monthly. Hardest part of the project is driving to the site which is about an hour from my house. That said...so far they pay promptly. An hour? Hahaha That’s nothing. Anyway, proud of you, for sticking to your plan, reaching your goals and sharing your successes. I&apos;m guessing you didn&apos;t use GCP&apos;s? Shouldn&apos;t matter just for stockpiles, just curious. Also, did you do the stockpile annotations? If you haven&apos;t already figured it out, it is much easier to take the off in the elevation view. Great job! From what I have read it is advised that you prep the drone. Launch the DJI Go app to check sat locks, make sure the IMU calibrations and compass calibration is registering OK (no errors)...then close the DJI Go App down and launch drone deploy to run the mission. There&apos;s no need to run DJI Go4 first. There&apos;s no need for any compass, IMU or sat checks ever anyway. DD does it&apos;s own checking before launching. You can run a mapping mission without ever starting DJI Go4. I didn&apos;t use GCPs. The drone company I was doing the work for didn&apos;t ask or request it. All seemed to work fine from their perspective. Yeah...that is what I did.